Most of you, my dear readers, won’t tweet this article. You just lack motivation for any kind of action, other than reading it. I know this because I rarely tweet articles myself, even when they’re plain awesome. I’m just too lazy to do that. But there are certain psychological triggers that you can pull to make your visitors tweet your stuff. Well… why don’t you just ask them? In the world of marketing “asking someone to do something” is called a “Call-to-Action”. And if you want your Call-to-Action to be effective, you should make it prominent enough to be noticed and specific enough to be comprehended. One other thing that works really well for Call-to-Actions is “reasoning”. Give people a reason why they should tweet your stuff and they will be much more likely to do that. Even with a prominent Call-to-Action and perfect reasoning many people will still ignore you. People are lazy and if you ask for too much – they won’t do that. How does it apply to tweets? 5. and only then publish the tweet. Too much hassle for a single tweet. So if you want your visitors to tweet your stuff – make sure there’s a Tweet button at their sight that will make tweeting hassle-free. People don’t just tweet anything. They tweet for a reason. I have a nice article, that explores our inner drivers and explains what we tweet and why – “What Do People Tweet About & The Surprising Truth About What Drives Them“. If you want your readers to tweet something – make sure it makes them look good. People love tweeting smart things, useful things, funny things, timely things, etc (really, you need to read this article). There’s one cool tactic that combines all three psychological triggers that I have explained above. It’s called “Tweetable Quotes” and many pro bloggers have been using it for quite a long time. Look at this post from Neil Patel: Business Advice In Three Words. The post is simply a list of tweetable quotes. How did you think it performed? That’s about 200% more tweets!! And he’s not the only one, who discovered this simple formula. So why Tweetable Quotes work so well in making visitors tweet more? it’s super easy to tweet them – you just need to click on them. Any quotes by famous people that you use in your article. You’ve used a quote by Steve Jobs in your copy? Great! Make it tweetable and your readers will appreciate that! Short takeaways from your article. If you have just shared something important with your readers see if you can recap it in one short sentence and make it tweetable. People will tweet it more eagerly, than the actual article. Any statistical data. People love statistics and they love tweeting them. Why don’t you make all statistics in your article tweetable? Catchy phrases. If you have some experience in copywriting and you’re capable of coming up with short catchy phrases that are smart and entertaining – you just HAVE to make them tweetable. So you have plenty of options when it comes to filling your article with some great tweetable quotes that people will share on Twitter. 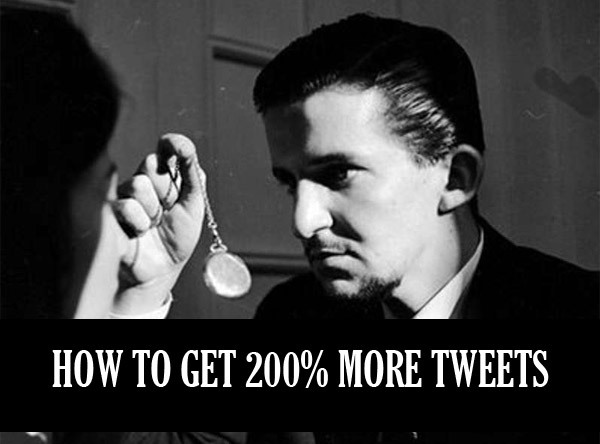 But how to make them “tweetable” and how to style them differently to stand out in your copy? TweetDis is a WordPress plugin, that will turn any piece of text into a fancy looking Tweetable Quote. I used TweetDis plugin to create those good looking Tweetable Quotes that you saw in this article. And I’m actually the one who created this plugin. I wanted to have fancy Tweetable Quotes at BloggerJet, but I just couldn’t find a good tool to create them. So I decided to create this tool myself. It would be silly not to practice what I preach, right? Asking for a tweet works! But giving a solid reason to tweet works even better! I know I started this article with an assumption that you won’t bother to tweet it. But since you’ve made it till the very end of it, can I ask you to pick any of my cool Tweetable Quotes and share it on Twitter? Great idea. Thanks for bringing it my attention. Ok.. I agree.. that was too offensive… I’m sorry.. I really didn’t mean that.. I’ve edited the post to make that part less provocative.. once again I’m sorry..
No sweat. I appreciated the idea. I am adding the plugin to my appropriate posts.